That was an awesome summer! Both staff and campers loved the Autistry Summer Camps and we will definitely offer them again in Summer 2015. The camps introduced many new families to Autistry and we are doing lots of new intake interviews. 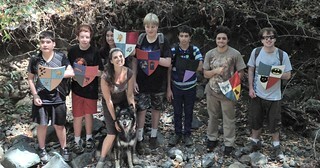 Now schools are back in session and Autistry is returning to the rhythm of the workshops and our focus is again on projects (and, of course the Faire!). April’s sculpture of The Thing. We often use books and illustrations as inspiration for projects. 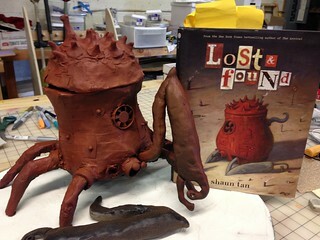 April loved the short story The Lost Thing in Shaun Tan’s collection Lost and Found. She is putting the finishing touches on her sculpture of The Thing. She created The Thing using the techniques we learned in the mask workshop taught by Angelique Benicio. She created a structure with chicken wire and covered it with rosin paper dipped in white glue. Many layers of texturing followed. April also used found objects like a small computer fan and various bits of shop detritus for the ground cover. 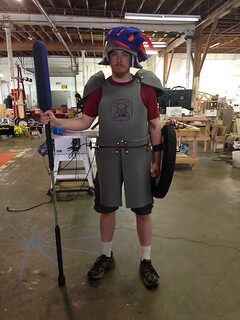 Medieval armor by Danny S. and Ian G. This is a complex piece of costuming made from rubber floor mats! Danny and Ian are still working out the panel-and-slash sleeves for the shirt and pants that will go under the armor. They have researched the costume design as well as the methods for making armor out of foam. They cut the breastplate logo into the rubber foam with a sharp knife and then used a hot air gun to gently widen the grooves. We love making things that we have never made before out of material that we have never used. We found several online tutorial that have helped us learn new techniques for working with E.V.A foam. Danny and Ian have a ways to go on this project but it is truly a labor of love and learning. Monopoly Man versus Wall Street Bull. Alex has taken a break from his epic graphic novel to paint a piece of social commentary. 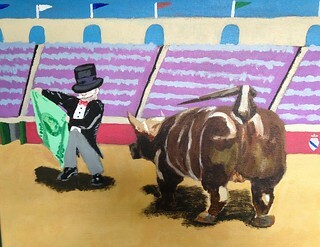 The Monopoly Man teases and encourages the raging Wall Street Bull using a $100 bill in place of a red cape. The painting is acrylic on canvas and, as with all the projects, will be on display at the 3rd Annual Autistry Faire on Sunday October 19th. The 3rd Annual Autistry Faire – EcoTech: Using our Powers for Good. It’s Faire time! 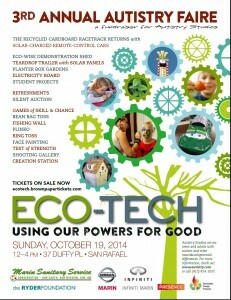 We are so excited about this year’s faire. The 40′ cardboard racetrack will return. We now have two levels of remote control cars – the super fast and the off-road crawler. There will be designated race times for each type of car. We found the racers were a little too fast for some of our faire-goers so Dan has made some special modifications and he is constructing an obstacle course to make this even more fun. We are thrilled to have Marin Nissan, Infiniti of Marin, Marin Sanitary Service, the Ryder Foundation, Presence Product Group, and Renewable Energy Products as sponsors this year. We are building custom cars for our event sponsors – there is still time for your company to race! You can find the Event Sponsor information here. What would a carnival be without games? Not much fun. So we are bringing back last year’s favorites and adding a couple new ones. Ashley is making the classic carnival High Striker, test of strength booth. There will also be face painting, bean bag toss, the shooting gallery (the La Porta family is designing another unique experience! ), and the ring toss. Booth sponsorship is another great way to support Autistry! There is so much happening at Autistry and one way to keep up with all the news is to join us on Facebook. We post photos of projects, news, and upcoming event info. Stay tuned – there is much more to come.